When it comes to hangers, there is a multitude available each with their own set of strengths. Have you ever been met by clothes scattered across your store's floor? If you do not own hangers suited to your stock then this may be an all too familiar sight for you. 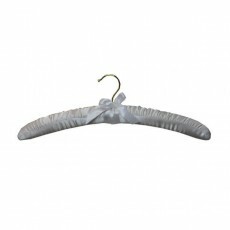 Our padded, satin hangers are ideal for presenting delicate clothing items. Delicate garments are susceptible to creases and unwanted marks. To stop this problem from arising it is imperative that you find a non-slip hanger. 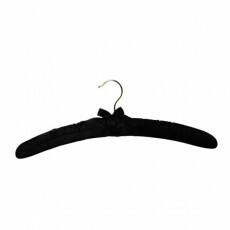 The velvet-like surface of a satin hanger provides the much-needed friction that will prevent your clothes from slipping. The term padded might imply that these hangers will take up a lot of room on your clothing rail. However, this is far from the case. Our satin hangers have a slim yet sturdy frame offset by a modern chrome hook. To showcase a distinctive look then you cannot go wrong with a satin hanger and our collection exhibits various colours and sizes for you to choose from. We opened our doors back in 1864 and ever since then we have been dedicated to bringing you the very best shop fittings. If you have a question regarding our satin hanger range please do not hesitate to contact us. We aim to get back to you in a timely fashion. Click here to view our entire range of clothes and coat hangers.